Time of Origin: Osphogus, the vulgar end of time, millennia in the far future. History: Banto Zame marks a particularly interesting adversary for The Doctor, as, while he never acted against The Doctor directly - barring some minor arguments - his actions nevertheless earned him The Doctor’s personal enmity even before they met face-to-face. While the full details of Banto Zame’s past are unknown, it is known that he was born on the planet Osphogus - described as being ‘a super-dense mudball’ by The Doctor in the present, but apparently terraformed five thousand years before Banto’s birth - in ‘the vulgar end of time’, a point in history where everything has been discovered and all major conflicts are over, with people being primarily interested in nothing more than their own pleasure. Banto apparently began a life of crime by stealing a five nim note from his mother’s purse. While he has said - in passing - that he’s married, it appears that he hasn’t had contact with his wife for some time, having spent the past few years running around with Sally-Anne Stubbins, a fellow con artist. One of their apparently most regular scams is to pose as The Doctor - knowledge of The Doctor having become apparently fairly common at this point in history due to his travels, although many believe him to be merely a legend rather than a real person - although their con was riddled with minor flaws, such as Banto possessing a psychic (Rather than sonic) screwdriver, and their ‘Stardis’ looking like a portaloo rather than a police box (Based on historical photographs of policemen always standing around them, Banto and Sally -Anne had assumed that the image they’d chosen for the Stardis was a police box). This con continued until Banto and Sally-Anne arrived in the Generios system, where they faked an invasion by the ‘Skelloids’, subsequently claiming that the ‘Stardis’ required ‘pluvon power crystals’ and they would need a hundred million credits to purchase the crystals. Before their departure, however, they were confronted by the Sixth Doctor and Mel, who had detected Generios’s distress call on the TARDIS’s long-range sensors, prompting The Doctor to investigate Banto’s presence; never having been to Generios in his past, and unable to sense the presence of a future incarnation, he naturally knew that Banto’s Doctor wasn’t another incarnation of himself. Initially believing The Doctor and Mel to be simply another couple of con artists attempting his scam, Banto had them thrown into the cells - dismissing them to the Generios leaders as excited fans - but the arrival of a mysterious giant cylinder demanding the three greatest treasures of the Generios system be delivered to it in three hours ended Banto’s attempts to escape. Although he initially dismissed it as The Doctor’s version of the Skelloids - showing his only real trace of morality as he commented that at least his cons left the people with the impression that they’d been saved, while the cylinder allowed the new arrivals to steal the three treasures and scarper with the loot - when The Doctor and Mel arrived, forcing Banto and Sally-Anne to take the ‘Stardis’ to the TARDIS, Banto realised that he was genuinely in the presence of The Doctor, being briefly overcome with shock (Sally-Anne, on the other hand, quickly appeared to develop a greater interest in The Doctor after learning his true identity). Despite The Doctor’s anger at Banto’s attempts to trade on his reputation - as well as the ‘insult’ of the ‘Stardis’s’ appearance - he and Mel were forced to work with Banto and Sally-Anne in order to recover the three treasures; Unit ZX-419, the ‘Shelves of Infinity’ - a masterful example of pan-dimensional engineering, the shelves’ components slid in and out of different dimensions as they were put together - Mentos - the ultimate source of information, consisting of a holographic interface with access to another dimension full of research devices that could travel to any point in existence - and a massive diamond (According to The Doctor, the largest diamond in all of time and space). Having gathered the treasures together and returned to Generios One - despite Banto’s attempt to briefly steal the TARDIS after Sally-Anne learned that he was already married - they displayed the treasures to the cylinder, which asked The Doctor to present himself so that it could give him a reward. 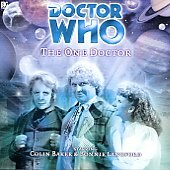 As Banto introduced himself as The Doctor, Mel and Sally-Anne attempted to protest, only for The Doctor to claim that he was Banto, going so far as to kiss Sally-Anne to reinforce the bluff. Although puzzled by The Doctor’s actions, Banto nevertheless continued to reaffirm that he was The Doctor, only to be shocked when the cylinder captured him in a tractor beam, revealing that it had been after The Doctor for its masters, the Sussyurats of Chalzon; having detected the news reports of The Doctor’s presence in the system, the cylinder had come to Generios and set the challenge of the quest for the treasures to positively identify The Doctor and take him back to its masters for trial. As Banto departed - The Doctor noting that he hadn’t met the Syssyurats yet but that he would be certain to really annoy them when he did so - The Doctor and Mel returned to the TARDIS, leaving Sally-Anne to reap the rewards of her reputation as The Doctor’s companion; The Doctor would rescue Banto at some future date, but for the moment, he felt that the universe was only big enough for the one Doctor.